NEW TIME - 12 p.m.
Request a position in the auction online or over the phone. Once accepted, upload a description and images of your vehicle to be placed on our website. We offer the opportunity to become a bidder in just 4 easy steps, with personal help over the phone if needed along the way. Don't miss out! ALL Consignments 25 years or older are FREE UNLESS SOLD! If your vehicle (25 years or older) doesn't sell, the registration fee is on us! Vehicles less than 25 years old may still be consigned; however, fees will not be refunded! Call 717-960-6400 to get involved! Can't get enough auction excitement? Neither can we. And now, you can experience a whole lot more, and save hundreds in the process. Snag a VIP Bidder's Pass for only $250 a year. 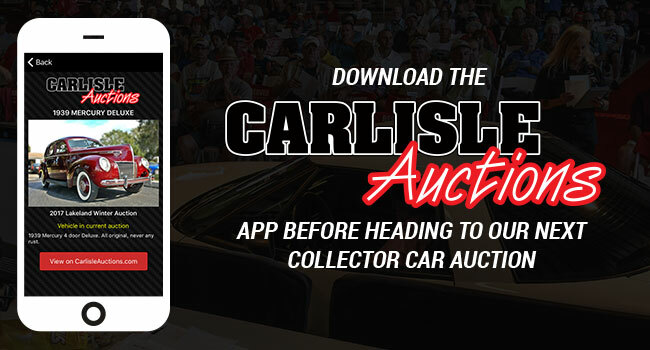 That's 4 Auctions with UNLIMITED access with perks like express check ins, a parking pass, reserved front-row seating, assistance, and an official Carlisle Auctions hat. Don't miss out on this opportunity, and don't miss out on your dream ride.